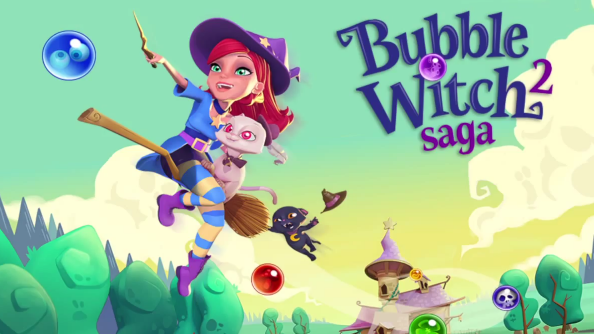 King, the creators of Candy Crush Saga, are bringing a brand new game to iPhone and iPad: Bubble Witch Saga 2. It’s a bubble matching game, where you have to match up rows of bubbles of the same colour to score points. Andy from Family Gamer TV has taken a look at it, and you can see some gameplay in this video. With it’s colourful graphics and easy to play nature, Bubble Witch Saga 2 looks like it could be the new Candy Crush. There’s a little spin on the kind of bubble matching gameplay we’re used to, with the addition of some cauldrons at the bottom of the screen. When your bubbles drop into the cauldrons you can start getting really big score multipliers for huge point bonuses. Bubble Witch Saga 2 is coming soon to iPhone and iPad. If you loved this video, follow us on Twitter for loads more amazing stories and gameplay footage, and subscribe to Family Gamer TV on YouTube.